Figure 2. A black and white photograph of a film bucket with strobe light (Courtesy of the National Reconnaissance Office). to the Kecksburg object. One such witness observed the bright object fly, slow, stop, and turn in the sky above him. Another witness claimed he had watched as the United States Army replaced trees the object had either damaged or closely passed over during its landing. Again, these two witnesses were males. Both men were extremely sincere when describing their experiences. They could also accurately recount their emotions and psychological states during their UFO-related encounters. I started to aggressively dig into the Kecksburg case in 2012 after being asked to prepare a brief talk on the event. However, the ingredients for this mystery were in the mix long before December 9, 1965. On October 24, 1957, the Central Intelligence Agency (CIA) birthed a spy satellite program code named Corona. Corona reconnaissance satellites changed the concept of unmanned covert intelligence collecting. The 1950s and 1960s were decades when it was extremely difficult to gather top-secret information about strategic military systems operated by the Soviet Union, Communist China, and their allies. By December 8, 1957 members of the CIA were busy building components for this highly classified project. In August 1960, the United States was poised and set to launch a reconnaissance satellite. The Corona reconnaissance satellite program enjoyed a lengthy period of development and success. The United States Government, however, did not acknowledge its use of space satellite imagery for intelligence missions until 1978 (Order et al. 1998). The Corona surveillance satellites were launched from Vandenberg Air Force Base in California. Each Corona satellite system employed a Thor-Agena rocket combination. The Thor-Agena arrangement incorporated a multi-stage rocket with a Thor first stage and an Agena second stage (Order et al. 1998). The Thor rocket alone has a maximum speed of about three miles per second—additional boosters could be used to increase the amount of lift off thrust. From June 1959 to January 1968, the Corona program employed the Thor-Agena system to launch military reconnaissance satellites operated by the CIA. In total, there were approximately 144 Corona satellites launched. However, only about 102 returned with usable photographs. Figure 1. 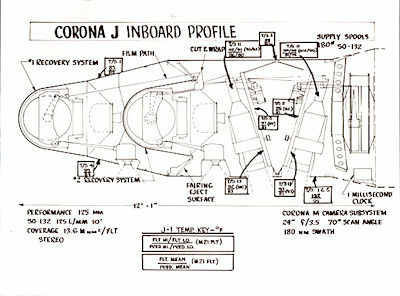 Components of a Corona SRV showing ablative forebody and film bucket assembly (Courtesy of the National Reconnaissance Office). Corona satellites employed Satellite Recovery Vehicles (SRVs). These recovery vehicles were essentially space capsules with nosecone-like forebodies featuring heatshields made from a type of a composite metal that, to a degree, burned away during reentry. Enclosed within the SRV’s protective heat shielded forebody was perhaps the most valuable part of the SRV. It was a gold-plated capsule designed to be recovered by parachute. This prized retrievable canister was called a film bucket (Figure 1). All Corona satellites used gleaming acorn shaped film buckets as part of their reentry vehicles. The buckets returned exposed surveillance film to Earth for expert assessment. These shiny bullet-like buckets were designed to be snagged by specially equipped cargo aircraft during a parachute descent through the atmosphere. The film buckets were designed to float in the ocean for a while—just in case the planes couldn’t snag them. To make a floating film bucket easier for a recovery plane to spot from the air, engineers fitted the film buckets with strobe lights (Figure 2, above top). On December 9, 1965, a dual panoramic camera system, strategically packed inside a cigar-shaped Corona satellite, was placed on top of a Thor augmented Delta-Agena D rocket. The rocket system was equipped with a Thor first stage and an Agena upper stage. This top secret satellite was scheduled to be launched from Vandenberg Air Force Base that day. Missiles and payload were ready and waiting to be hurled into space. Although the Corona program had been classified as top secret since 1963, this particular spacecraft, Satellite KH-4A 1027, was especially secret. Modifications to the overall satellite’s system allowed a second recovery vehicle to be added to the spacecraft. It is reasonable to think that one of the SRVs had a potent nuclear experiment packed on board. The National Aeronautics Space Administration (NASA) has not yet supplied sufficient details about the true nature of this nuclear emulsion experiment. From the onset, disinformation has been an integral part of the Corona program (Norman 2017). Therefore, based on continual research, I can confidently surmise that the magnetosphere study may have encompassed at least three possible sorts of nuclear trials. I ranked these proposed experiments by danger levels. The danger levels take into account both physical and political safety considerations. Nuclear explosive devices generate heat, light, X-rays, gamma rays, and subatomic particles. More importantly, the resulting shock wave would expand in all directions since there is essentially no atmosphere at extreme heights. A moving electron is affected by a magnetic field, so scientists needed to know how electrons flow along the Earth’s magnetic field lines and drop into the upper atmosphere. When nuclear explosive devices are detonated, electrons undergo incredible acceleration. Thus, they create an extremely powerful magnetic field. This is called an electromagnetic pulse (EMP). The pulse can affect the flow of electricity on Earth hundreds of miles away. Electrons from such a blast would linger in space for months. Trapped by Earth’s magnetic field, an artificial radiation belt would be formed above Earth’s surface. As a result, attempted high altitude nuclear device tests ought to use only small amounts of explosive materials. Currently, explosion energies related to such tests are classified (Pait 2012). Satellite KH-4A 1027’s nuclear experiment may have been a covert attempt at atmospheric testing. Corona satellite systems were known for weight variance issues. Such issues can cause angular problems during a spacecraft’s flight. Therefore, sometime after launch, problems developed with controlling the orientation of the spacecraft. A slight velocity-related angular error resulted in a decidedly misbehaving liftoff. This angular error caused the spacecraft to stray outside of its allowable launch azimuth. The rocket’s behavior indicated to its controllers that the satellite might not achieve the intended orbit (Day et al. 1998). The ground command controllers were desperate to find the root of the spacecraft’s attitude dilemma. Consequently, instead of heading south, the rocket system headed for a launch trajectory that would cut a northeasterly path across the United States. Any azimuth angles far north or east would send the spacecraft over habitable areas. Such a path would adversely affect safety, termination, vehicle separation, and political considerations. Normally, such a problematic launch would be aborted by a range safety officer who would send a destruct signal to destroy the missile. Defective range safety equipment may have figured into the complication. More likely; however, range safety controllers were concerned about destroying a missile transporting a nuclear experiment—especially if the rocket was directly over the launch pad, a railroad train passing through the area, or a populated section of California. As a sidebar, in 1962, nuclear weapon launch failures from Johnston Atoll in the Pacific Ocean—another United States satellite launch site—caused serious contamination to the island and surrounding areas. Various alleged test launch failures in 1962 scattered radioactive debris over Johnston Island contaminating it, the lagoon, and a nearby island (Nautilus Institute 2005). In an attempt to regain control of Satellite KH-4A 1027’s orientation, the foreword recovery vehicle (SRV-1) was separated from the spacecraft. The separation was done at some time before the engine burn that would have injected the satellite into orbit. This action was followed by placing the aft recovery vehicle (SRV-2) into a passive mode for the time being. Fortunately, jettisoning SRV-1 resolved the Corona satellite’s attitude problem for the time being. Due to the conditions described above, Corona spacecraft KH-4A 1027 was in all probability placed into a less desirable, not-so-camera-friendly orbit. The satellite remained in that orbit for two days. For that reason, the spacecraft was operating for two days before its SRV-2 could be safely coaxed back to Earth. Thus, after just two days of operation, SRV-2 reentered Earth’s atmosphere and its film bucket was recovered in the air by a designated Air Force recovery team. The quality of the exposed film in the recovered bucket would indicate if the satellite’s cameras operated satisfactorily. A Thor rocket alone, without the assistance of other boosters, travels at a speed of about 11,505 mph. Technically, at that speed, it would take less than fifteen minutes for something launched from Vandenberg Air Force Base in California to reach Kecksburg, Pennsylvania. As it sped through the atmosphere, SRV-1’s ablative forebody would glow and melted away due to the resultant extreme heat. Chunks of melting hot matter could fall to Earth and started grass fires. The vehicle’s high speed would cause sonic booms (MUFON 2009). At around 4:47 P.M. Eastern Time on December 9th, SRV-1 was maneuvering in the air above Western Pennsylvania. Its cold gas spin components hissed as it flew above the tree tops (Gordon 2001). Just before landing, four explosive charges on board SRV-1 were fired. The charges were used in conjunction with ejection pistons to eject the recovery vehicle’s parachute system cover. Detonating the four charges simultaneously created a star-like effect in the sky. Consequently, the routine of jettisoning a two-parachute deceleration system was put into motion (Clausen and Miller 2012). Under normal conditions, the first decelerator parachute would slow the reentry of the thermal-shielded vehicle and pull out the main parachute—thus separating the film bucket from the forebody. In this case; however, the film bucket started to eject from the reentry vehicle’s forebody at an altitude much lower than usual. Therefore, the bucket was only partially detached from the forebody when the bucket/forebody combination collided with the trees below. Fortunately, the flexible branches and small tree trunks slowed the decent without much damage to the vehicle. The shiny film bucket with a scorched forebody connected to its front end, creased the forest’s supple topsoil. Upon hitting the dirt, the payload forged through an old creek bed. When the object came to a complete stop, the seared orange forebody looked as if it was a proper extension of the shiny gold film bucket (Gordon 2015). At that point, the object would look like a true anomaly—a large golden acorn with a protuberance resembling a burnt orange trashcan on its front (Robinson 2017). The exposed film bucket almost certainly had identification marks etched into its base. These marks would have been made by launch preparers who utilized symbols found in the Phillips Laboratory emblem to label the bucket (Mulcahy 2012). The Phillips’ emblem combines a Zia symbol with stars (Bass et al. 1995). Thus, it was not a fluke that the identification symbols engraved on the bucket included straight lines, circles, broken lines, and stars (Gordon 2015). Almost as soon as it stopped moving, the film bucket’s recovery aids would have started working. The radio frequency beacon began broadcasting a signal and the strobe light on top of the capsule started flashing. Anyone hunting for the device would know exactly where to find it. Several media outlets from Western Pennsylvania picked up on this as a UFO story. Media hosts from the powerful KDKA-Radio and KDKA-TV stations began broadcasting information about the suspected UFO incident in and around the Pittsburgh Area. It wasn’t long before police cars and at least one firetruck arrived at the landing site. Alerted by the news media’s announcements, droves of idle people in KDKA’s listening and viewing area launched spontaneous expeditions to Kecksburg. Throngs of thrill- seekers set out for the woodlands. Several of them beat the crowds to what appeared to be the UFO landing spot in hopes of getting unobstructed glimpses, and maybe a few photographs, of the unusual object. Then, within a relatively short period of time, at least a hundred uniformed individuals, representing various branches of the military, joined the police to rope-off part of the forest. The authorities present started warning visitors to stay away from the area because there was a risk that radiation might be leaking from the object (Farrell 2004). Soon, individuals wearing radiation protection suits and operating Geiger counters wandered into the woods searching for traces of radiation. Other similarly-suited people carried a large box—a box likely lined with lead to transport radioactive materials (Ventre and Eichler 2015). Such precautions would be required to safely retrieve Phillips Laboratory’s nuclear experiment. Armed guards were eventually posted on the roads. Then, in an orderly military fashion, a secure perimeter was set-up around a rather large zone of woodsy Pennsylvania. As the evening progressed, the Air Force began to set up a command center at a local fire station. Understandably, Dr. Eric Walker was called to the Kecksburg site to assess the danger of the immediate situation and recommend actions regarding nuclear waste management and disposal. In 1965, Dr. Walker was the President of Penn State University and served as an expert in Nuclear Science, Nuclear Engineering, and Nuclear Waste Materials. An abandoned airport in nearby Latrobe, PA would have been used to accommodate Dr. Walker’s flight from University Park to Kecksburg (Farrell 2004). As expected, Dr. Walker advised the local command center officials to move the Pennsylvania space debris (now contaminated with radioactivity after incurring landing-related damage) to Wright Paterson Air Force Base in Ohio where it would eventually be buried. Two large trucks were summoned to Kecksburg. A United States Army star was displayed on at least one of the trucks. Late that night, the small truck convoy left the area. A flatbed truck hauled away the bullet-shaped SRV and film bucket under a tarp (Gordon 2017). Another truck carried boxed nuclear experiment parts. At least two different sized objects were transported away from the site. The large acorn arrived at Lockbourne Air Force Base near Columbus, Ohio on the morning of Friday December 10, 1965. On Saturday, December 11, 1965 it reached its destination at Wright Patterson Air Force Base in Dayton, Ohio. In 1963, a late modification to the Corona system added a second film bucket and recovery vehicle to these spy satellites. Although the film recovery mechanism was commonly referred to as a bucket, it clearly resembled a copper kettle with a rounded bottom. These buckets were gold plated and shaped like a big acorn (Figure 3). They were beautiful. But, they were designed primarily to be functional—the buckets returned exposed surveillance film to Earth. With two recovery vehicles positioned inside each satellite (Figure 4), the filming capacity for a given mission increased. Satellites sporting two film buckets could eject the first bucket to Earth, while the second bucket was deactivated and stored passively in orbit (Ruffner 1995). The second bucket could begin filling immediately thereafter, or filming could be delayed for days. Furthermore, to keep the Soviet Union or Communist China unsure about the true purpose of the Corona program, some satellite missions included classified scientific experiments in one bucket while the other bucket was intended solely for film (Aga 2013). However, adding a second recovery vehicle and film bucket to an already complicated satellite system required a major, as well as sensitive, redesign of Corona’s command and control mechanisms (Day et al. 1998). Figure 3. 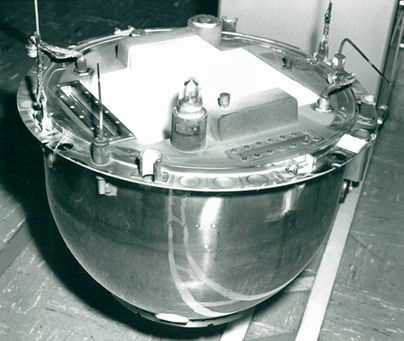 A film bucket return capsule used in Corona satellites (Courtesy of the National Reconnaissance Office). The KH-4A camera system was the first to use multiple film buckets and was referred to as the J-1 model. If all went well during separation and reentry, the gleaming film bucket was recovered by well-trained team members of a select fleet of Air Force cargo planes. Corona satellites flew in low Earth orbits to optimize the resolution of the camera systems employed. Figure 4. A Corona J-1 system payload featuring two tandem Satellite Recovery Vehicles (Courtesy of the National Reconnaissance Office). The J-l model carried two reentry vehicles and two panoramic cameras. Thus, by design, one Corona satellite housed two SRVs. Each SRV had a shimmering film canister enclosed. Of the 52 J-1 satellites launched between 1963 and 1969, only 94 of the 104 SRVs were recovered—ten were lost (Intellipedia 2014). The hull of the J-1 model satellite held the two SRVs in tandem. Each SRV had a forebody that was a capsule-like ablative heat shield which also functioned as a nose cone. Tucked away inside the ablative forebody was the mirror-like golden film bucket. The buckets were made of consecutive layers of metal and plastic and were plated with gold to provide a protective smooth finish (Clausen and Miller 2012). A film bucket, two parachutes, a retro rocket, pistons with explosive charges, and stabilization jets were all carefully stuffed into each SRV’s ablative forebody. The stabilization jets used a cold gas spin mechanism that employed specialized nozzles and a tank filled with three gases (Central Intelligence Agency 1976). The stabilization jets in combination with the retro rocket could steer the vehicle and alter its speed. If by chance a film bucket was not air-recovered, a radiofrequency beacon and flashing strobe light were built into each gold plated capsule to provide location information (Clausen and Miller 2012). These buckets were designed to be precisely attached to the inside of the ablative forebody. Ablative heat shields were constructed of experimental materials designed to absorb and dissipate extreme hotness by melting or wearing away the heat shield of an SRV speeding through the atmosphere. The ablative process involved melting and vaporization. Molten materials carried the energy caused by aerodynamic heating away from the forebody (Sutton 2006). The film bucket’s thin gold coating helped to protect its contents in case the heat shield failed (Neufeld 2014). For the most part, the glimmering buckets carried precious cargos. The buckets were originally designed to bring back exposed film taken of faraway places of interest, but sometimes the buckets hid scientific and quasi-scientific experiments. A big, shiny, goldish-yellow colored acorn was reported by individuals who were lucky enough to make it into the woods that December day in 1965. Other witnesses would eventually come forward twenty-two years later and maintain that the object was big, metal, and shiny gold and burnt orange in color. It had no rivets, portals, seams, or visible openings. Some of these now mature observers saw an arcing bright light coming off of the object. At least one onlooker recalled seeing a distinct raised gold band around the thing’s base—it seemed to serve as a bumper. Odd symbols were etched or maybe welded into the band. For the most part, combinations of circles, stars, straight lines, dots, and broken lines made up the band’s geometric markings (Farrell 2004). The SRV’s burnt forebody, shiny film bucket, and remnants of the Phillips’ nuclear experiment were trucked to Wright Patterson AFB. Overall, the mysterious cargo looked to be about the size of a Volkswagen (VW) Beetle automobile. In 1965, VW Beetles were about 5 feet wide and 13 feet long. At Wright Patterson, the Corona SRV components were deposited in a landfill which served as a burial site for radioactive waste materials (Engineering Science 1982). 1. Tucked away inside the ablative forebody was a film bucket made of consecutive layers of metal and plastic and plated with gold (Clausen & Edward 2012). 2. With two recovery vehicles positioned inside each satellite the filming capacity for a given mission increased enormously. J-1 model satellites sporting two film buckets could eject the first bucket to Earth, while the second bucket was deactivated and stored passively in orbit. (Ruffner 1995). 3. Each SRV had a forebody that was a capsule-like ablative heat shield which also functioned as a nose cone. Tucked away inside the ablative forebody was a mirror-like golden film bucket. The buckets were made of consecutive layers of metal and plastic and were plated with gold to provide a protective smooth finish (Clausen & Edward 2012). 4. There was a Nuclear Emulsion Experiment on board Spacecraft KH-4A 1027. Nuclear emulsion experiments involved performing scientific procedures concerning radioactivity and cosmic radiation, as well as the effect of radiation on various materials and tissues. The Phillips Laboratory was conducting the nuclear emulsion experiment on board this satellite. Phillips conducted experiments related to studying radiation contamination and the magnetosphere (National Aeronautics Space Administration 2017c). 6. The National Aeronautics and Space Administration (NASA) also reported the following: There was 1 experiment returned. There was no data collections returned (National Aeronautics Space Administration 2017b). 7. Its gold-plated sides gleamed brightly in the light streaming in through the recovery doors. We also took notice that the top was scorched and in some areas, handwriting was visible, probably from the launch preparers. The homing beacon was still broadcasting its signal and the strobe lights on top of the capsule were still blinking (Mulcahy 2012). The Philips Laboratory emblem combines a Zia symbol with stars (Bass et al. 1995). The identification symbols engraved on the bucket were zigzag lines, straight lines, circles and other shapes (Robinson 2017). 8. The stabilization jets in combination with the retro rocket, under certain conditions, could steer the vehicle and alter its descent speed. This SRV’s stabilization jets used a cold gas spin mechanism that employed specialized nozzles and a tank filled with three gases (Central Intelligence Agency 1976). 9. 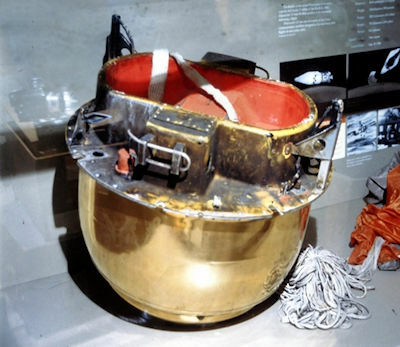 Also, if by chance a film bucket is not air-recovered, a radiofrequency beacon and flashing strobe light were included in the gold plated capsule to provide location information (Clausen & Edward 2012). 10. A radiofrequency beacon and flashing strobe light were included in the gold plated capsule to provide location information (Clausen & Edward 2012). Some Pennsylvania residents saw the object moving slowly in the sky; others saw smoke and brilliant bluish-white lights like an electric arc when it first crashed (Kean 2005). 11. Explosive charges were used in conjunction with ejection pistons to eject the recovery vehicle’s parachute system cover. As a result, a two- parachute system was jettisoned (Clausen & Edward 2012). Detonating the four charges would create a star-like effect in the sky. 12. In 1965 Wright Patterson Air Force Base in Dayton, Ohio maintained a landfill which served as a burial site for radioactive waste materials (Engineering Science 1982). 13. The Tribune Review said it would not run the MUFON Kecksburg UFO story because it would hurt the Kecksburg Fire Department fund raiser (UAMN TV 2017). 14. Penn State University has a history of supporting and leading in the fields of nuclear science, nuclear engineering, and nuclear waste management and disposal. Penn State developed its own nuclear reactor on campus. Penn State’s entry into the field of nuclear science is due to the efforts of Dr. Eric Walker—President of Penn State University from 1956 to 1970 (Vincenti and Dornsife 2005). 2. There, maybe a quarter-mile into the woods, laid this thing—burnt orange, maybe 10 feet long, shaped like an acorn, he said (Gibb 2003). 3. It reportedly dropped hot debris that started grass fires in Michigan and Ohio (MUFON 2009). Several witnesses were in a position to see the object without obstruction and noticed a rounded protuberance at the front of the object (Gordon 2015). 4. After a short period of time, individuals wearing radiation protection suits showed up. They were operating Geiger counters and wandered into the woods searching for something. Other similarly dressed people were walking around the area carrying a large box. (Ventre and Eichler 2015). 5. All the cameras operated satisfactorily (National Aeronautics Space Administration 2017a). These capsules were dropped following secret missions and sometimes they fell where they were not supposed to. No secret mission could have led to the reentry of a capsule that day (Kean 2005). 6. Individuals wearing radiation protection suits showed up. They were operating Geiger counters and wandered into the woods searching for something. Other similarly dressed people were walking around the area carrying a large box (Ventre and Eichler 2015). On December 11, 1965, the SRV-1 ablative forebody, shiny film bucket, and its radioactive nuclear experiment remains were returned to Wright Patterson AFB in Ohio by the Army. Thus, the SRV-1 film bucket was not recovered by the special Corona Air Force Recovery Team. 7. On the back of the object was the raised up area that the witness called the “bumper area” that he related to the cupule part of an acorn. It was on this raised structure that he saw what looked like symbols. He recalled seeing among those symbols zig-zag lines, stars and circles (Gordon 2015). 8. Another eyewitness described the object as “sort of acorn-shaped” with a raised area around the back and brownish-greyish in color with fire coming out of the back of it. There was a rounded part on the very tip of the object, and it seemed to be covered in some kind of vapor which enveloped it as it flew by. Only a mere 200feet in the air and hissing as it passed (Robinson 2017). 9. Witnesses also said, “It glowed green in the sky; it was a burnt orange color on the ground; the site may be radioactive; there was an arcing blue light coming from the woods; it looked like Egyptian hieroglyphics were welded on a bead in different designs around the base; and that four guys in NASA moon suits took a four to five foot box into the area” (Ventre and Eichler 2015). 10. Many people say that the military, including members of the Army and Air Force, began to arrive in the area around the village of Kecksburg within a few hours after the reported landing (Gordon 2017). It was giving off flashes of bright arcing light (Ventre and Eichler 2015). 11. And, during the final moments of the event when the reentry vehicle landed in Kecksburg, an eyewitness remarked about seeing a “four star” object (Ventre and Eichler 2015). 12. A few days after the incident had taken place, a truck driver using the pseudonym Myron was delivering special bricks to Wright-Patterson AFB in Dayton, Ohio. Myron’s firm had ordered 6,500 double-glazed bricks which he claimed “were for building a double-walled shield around a recovered radioactive object.” He first noticed the “bell-shaped” object whilst he was unloading the bricks; he said it was resting on stilts with large parachute-like screens covering it up. The shape was silhouetted by floodlights and he managed to get a closer look through a small opening in the tent (Robinson 2017). 13. Are we looking for truth (UAMN TV 2017)? 14. Over the years, a series of researchers questioned Dr. Eric Walker about his involvement in UFO phenomena including his presence at the site of a crashed of an alleged UFO in Kecksburg, PA in December 1965 (Cameron 1991). Dr. Eric Walker, the president of Penn State University at the time, admitted to visiting the Kecksburg crash site on December 9, 1965 (Rudiak 1991). Corona satellite KH-4A 1027 was launched from Vandenberg Air Force Base in California at 1:07 P.M. Pacific Time on December 9, 1965. Due to acute issues with controlling the spacecraft’s orientation in flight, recovery vehicle SRV-1, containing a golden film bucket that concealed a nuclear experiment from the Phillips Laboratory, was separated from the main body of the satellite prior to it achieving orbit. SRV-1 and its film bucket crash landed at Kecksburg, Pennsylvania on December 9, 1965—the day of the launch. NASA described a Phillips Laboratory nuclear experiment on board Spacecraft KH-4A 1027. The United States Army returned the crashed ablative forebody and golden film bucket that housed the experiment, along with related radioactive materials, to the Air Force at Wright Patterson Air Force Base (WPAFB) on December 11, 1965. However, NASA failed to report the date when that nuclear experiment was given back. Nevertheless, the nuclear experiment was returned by the Army—not recovered by the Air Force. Furthermore, no data was collected from the magnetosphere-related test (National Aeronautics Space Administration 2017c). The information gathering component of the test was damaged when the bucket made contact with trees prior to landing. The objects were transported to Dayton, Ohio because WPAFB maintained a burial site and landfill for radioactive materials there (Engineering Science 1982). 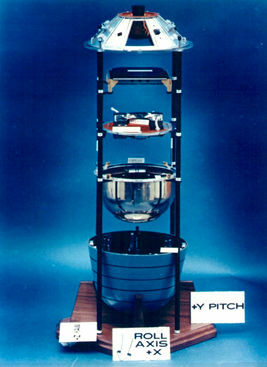 Two days after launch, SRV-2, which contained a film bucket with exposed film from the mission, was recalled from its orbit and recovered by one of the several US Air Force Corona Special Recovery Teams. Therefore, after reviewing the currently existing literature, I conclude that my hypothesis is true: Corona Satellite (KH-4A 1027) was launched from Vandenberg Air Force Base in California on December 9, 1965. One of the satellite’s recovery vehicles (SRV-1) separated early from the satellite due to an attitude problem. So, this recovery vehicle is a highly viable candidate for the object that landed at Kecksburg on that same date. SRV-1’s ablative forebody in combination with its golden film bucket made up the mysterious object that crash landed at Kecksburg in1965. In closing, the Kecksburg UFO was neither a manmade space probe with unique reentry control capabilities, nor a deep space probe from a planet other than Earth. * Dr. Bob Wenzel Gross is a semi-retired researcher and writer with a forthcoming non-fiction memoir entitled: In Pursuit of Anomalies: How Great Music and Real UFOs Can Save the Human Race. Dr. Gross has worked as a researcher, field investigator, scientist, writer, lecturer, educator, administrator, change agent, turnaround specialist, and professional musician. Dr. Bob Wenzel Gross is an artist who works with music by nature—and he is a scientist out of necessity. Dr. Gross holds a Doctorate from Penn State University where his solid approach to advanced research resulted in PSU’s Graduate School awarding his dissertation an excellent rating. Moreover, he has 40 years’ experience as an educator at all levels of instruction and has been an adjunct professor at Penn State University, Indiana University of Pennsylvania, New Mexico State University, and South Texas College. Email: rwgross98@hotmail.com. [Aga, B]. 2013. Secret Satellite. [Video File 52:16]. April 26. Available on line at https://www.youtube.com/watch?v=wwmX4FRptpk&t=1431s. Bass, J. N., U. DasGupta, C.A. Hein, J.M. Griffin, et al. 1995. Radiation Belt Analysis and Modeling. Bedford, Massachusetts: RADEX, Inc.
Cameron, G. 1991. May 30, 1991 Interview Henry Victorian and Dr. Walker - Topic December 9, 1965 crash at Kecksburg PA. The President UFO Website (August 6). Available on line at http://www.presidentialufo.com/dr-eric-walker/224-may-30-1991-interview-henry-victorian-and-dr-walker-topic-december-9-1965-crash-at-kecksburg-pa.
Central Intelligence Agency. 1976. Corona Program History Volume IV Recovery from Orbit. April 22. Available online at https://filearkive.com/document/image/CIARDP89B00980R0005001000018_full-0.html. Clausen, I. and E. A. Miller. 2012. INTELLIGENCE REVOLUTION 1960: Retrieving the Corona Imagery That Helped Win the Cold War. Chantilly, Virginia: National Reconnaissance Office Center for the Study of National Reconnaissance. Day, D.A., J.M. Logsdon & B. Latell. 1998. Eye in the Sky: The Story of the CORONA Spy Satellites. Washington and London: Smithsonian Institution Press. Engineering Science . 1982. Installation Restoration Program Phase 1: Records Search Wright-Patterson AFB, Ohio. Atlanta, Georgia: Engineering-Science. Farrell, J. 2004. Reich of the Black Sun: Nazi Secret Weapons and the Cold War Allied Legend. Kempton, Illinois: Adventures Unlimited Press. Elementary School Classroom: A Literature Review. Unpublished master’s thesis, University of Wisconsin-Stout, Menomonie, Wisconsin. Gibb, T. 2003. People in Kecksburg want to resolve what fell from the sky in 1965. Westmoreland County (July 31). Available on line at http://old.post gazette.com/neigh_westmoreland/20030309kecksburgwestmor1p1.asp. Gordon, S. 2001. Kecksburg - Response, Review & Update. UFO UpDate (April 23). Available online at http://www.ufoupdateslist.com/2001/jan/m29-002.shtml. Gordon, S. 2015. Kecksburg UFO Witness Says Object Was Not GE Mark 2 Reentry Vehicle . Stan Gordon’s UFO Anomalies Zone (November 26). Available on line at http://www.stangordon.info/wp/news-events/page/2/. Gordon, S. 2017. Kecksburg incidents and updates. Stan Gordon’s UFO Anomalies Zone (April 26). Available online at http://www.stangordon.info/wp/kecksburg/. Intellipedia. 2014. Corona (satellite) From Intellipedia. August 2. Kean, L. 2005. Forty Years of Secrecy: NASA, the Military, and the 1965 Kecksburg Crash. International UFO Reporter 30(1): 9. MUFON. 2009. Kecksburg Crash – 1965 (August 22). Available on line at http://www.mufon.com/kecksburg-crash---1965.html. M u l c a h y, R.D., Jr. (Ed.). 2012. Corona Star Catchers: The Air Force Aerial Recovery Aircrews of the 6593d Test Squadron (Special), 1958-1972. Chantilly, Virginia: National Reconnaissance Office Center for the Study of National Reconnaissance. National Aeronautics Space Administration Jet Propulsion Laboratory Mission and Spacecraft Library. 2016. Search for Corona Program. December 3. Available on line at http://space.jpl.nasa.gov/msl/Programs/corona.html. National Aeronautics Space Administration Space Science Data Coordinated Archive. 2017a. NSSDACA Master Catalog Search for Spacecraft KH-4A 1027. April 22, 2016. Available online at https://nssdc.gsfc.nasa.gov/nmc/spacecraftDisplay.do?id=1965-102A. National Aeronautics Space Administration Space Science Data Coordinated Archive. 2017b. NSSDACA Master Catalog Search for Experiments on Spacecraft KH-4A 1027. April 22, 2016. Available on line at https://nssdc.gsfc.nasa.gov/nmc/experimentSearch.do?spacecraft=KH-4A 1027. National Aeronautics Space Administration Space Science Data Coordinated Archive. 2017c. NSSDACA Master Catalog Search for Experiments on Spacecraft KH-4A 1027. October 21, 2016. Available on line at https://nssdc.gsfc.nasa.gov/nmc/experimentSearch.do?spacecraft=KH-4A %201027. National Aeronautics Space Administration Space Science Data Coordinated Archive. 2017d. NSSDACA Master Catalog Search for Experiments on Spacecraft KH-4A 1027. August 8, 2017. Available on line at https://nssdc.gsfc.nasa.gov/nmc/experimentDisplay.do?id=1965-102A-01. National Reconnaissance Office. 2017. Declassified Records: Index, Declassified Collection of CORONA, ARGON, and LANYARD Photographs. April 25. Available online at http://www.nro.gov/foia/declass/CAL-Photos.html. Nautilus Institute. 2005. Cleaning up Johnston Atoll. August 2. Available online at http://nautilus.org/apsnet/cleaning-up-johnston-atoll/. Neufeld, M.J. 2014. Milestones of Space: Eleven Iconic Objects from the Smithsonian National Air and Space Museum. Washington, D.C.: Zenith Press. (June 1959 – May 31, 1972). Historyofinformation.com (August 25). Available online at http://www.historyofinformation.com/expanded.php?id=3144. Order, F.C.E., J.C. Fitzpatrick, P.E. Worthman. 1998. The Corona Story. Chantilly, Virginia: National Reconnaissance Office. Plait, P. 2012. The 50th Anniversary of Starfish Prime: The nuke that shook the world. Discover Magazine. Bad Astronomy (August 17). Available on line at http://blogs.discovermagazine.com/badastronomy/2012/07/09/the-50th-anniversary-of-starfish-prime-the-nuke-that-shook-the-world/#.WZnxFCh95PY. Popular Mechanics. 2010. A Brief History of Animals in Space. August 15. Available online at http://www.popularmechanics.co.za/science/a-brief-history-of-animals-in-space/. Robinson, J.P. 2017. The Remarkable Kecksburg UFO Incident. J.P. Robinson: Author, Truth Seeker and Free Thinker (April 29). Available on line at http://www.jp-robinson.com/single-post/The-Remarkable-Kecksburg-UFO-Incident. Rudiak, D. 2001. Re: Dr. Eric Walker & MJ-12 – Rudiak. UFO UpDates (August 6). Available on line at http://www.ufoupdateslist.com/2001/jun/m09-022.shtml. Ruffner, K.C. 1995. Corona: America’s First Satellite Program. Washington, D.C.: History Staff Center for the Study of Intelligence Central Intelligence Agency. Stratopedia. 2017. Nuclear Emulsion. August 17. Available on line at http://stratocat.com.ar/stratopedia/427.htm. Sutton, G.W. 2006. The Initial Development of Ablation Heat Protection: An Historical Perspective. Space Chronicle: JBIS, Vol. 59, Suppl. 1. [UAMN TV]. (2017, June 30.). The Kecksburg UFO Crash Has Finally Been Solved. [Video File 43:57]. August 3, 2017. Available on line at https://www.youtube.com/watch?v=b2skQUyIR5I&t=3157s&index=17&list=PLgj8f8ImJ0vlUTTY1kLZ2W26Rpxw9JWA9. Ventre, J. and O. Eichler. 2015. Has A Top 5 UFO Case Been Solved? Was the Kecksburg UFO A GE Mark 2 Reentry Vehicle. Fade To Black (April 23). Available online at http://jimmychurchradio.com/has-a-top-5-ufo-case-been-solved/. Vincenti, J.T. and W.P. Dornsife. 2005. TEACHING ABOUT NUCLEAR SCIENCE AND TECHNOLOGY: WASTE MANAGEMENT AND DISPOSAL AN IMPORTANT SUBJECT. Unpublished paper. Penn State University, University Park, Pennsylvania. After Fifty Years, Kecksburg UFO Mystery Solved? I'm interested in what Clark McClelland has to say about this version of the story. I find the facts presented here are very clear and convincing, but enough for me to accept that this case is solved. Photo evidence of the actual object at the scene would help to remove any doubt about what this object really was. I have in my possession NASA documents that show this Corona Satellite was launched from California on 12/09/1965; NASA documents that show the satellite had a nuclear experiment on board; NASA documents that show the satellite had problems during launch; NASA documents that show the satellite's nuclear experiment was returned—not recovered by an airborne or waterborne Corona Recovery Team; eyewitness statements describing the object in the sky; eyewitnesses statements about parts of the satellite on the ground describing its golden film bucket and forebody specifically; artists’ renditions of eyewitnesses’ statements about what they observed at the scene (that clearly match photographs of the satellite’s components); and photographs of all of the satellite's components (including the golden film bucket and ablative forebody). . . . However, I do not have photo evidence of the actual object at the scene--yet. Do any exist? Thanks much, Dr. Bob Wenzel Gross. . . I don't know of any recent NASA document that confirms that the Kecksburg object was in fact Corona SRV-1. Maybe I missed it or you can provide me such document. It's obvious that the Corona Satellite project is no longer classified in regards to the hardware, so why are we still dealing with this mystery. Why are you, Dr. Wenzel providing answers that NASA clearly should have done by now? I would like to see some official response from NASA. NASA documents relating to the specific events are purely historical data without any firm admittance that it was a NASA vehicle in question. This case is still open and it needs someone at NASA to step up and confirm. While the Corona Satellite project was declassified around 1995, the contents of such satellites may still be classified.